The little cotton spool quilt is finished now, and is hanging up on the wall. I am really pleased with the way it has turned out. I think it looks great in it's new home. Er.....excuse me, have you got any sunflower seeds? Mr King (parrot) (not a very original name, I know) usually visits at this time of year. He will fly around the house looking in the windows for me. This morning, just before 7am, he was waiting patiently (for his seeds) on a chair on the back verandah. Do you feed birds too? One of the projects I am working on at the moment. 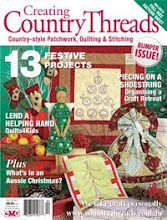 It has these words around the border - 'On days when I can sit and stitch, my life runs smooth without a hitch'. The project is a mat to put a sewing machine on, but I thought it would look nice as a wall hanging, in my studio. I have been wanting to sew this one for quite a while now (have had the pattern for many years). It is designed by Janelle Wind. I love these spool blocks. I have put a different sewing machine design in the middle. I still have to do all the blanket stitch around the applique pieces. And finish the writing. Janelle's pattern in the magazine. Our fragrant wisteria is looking lovely at the moment, the pavers below are covered in a carpet of purple confetti. 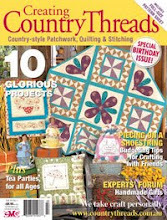 My first project to be published in Country Threads magazine is out now. I was sooo excited to receive my copy in the mailbox!! The project I designed is a pattern book cover, featuring those cheeky bowerbirds. Inspired by the bowerbirds who visit my garden. I love to look in the bower and see what blue treasures he has collected. Yesterday, I went with my quilt group on a bus trip to Hervey Bay and Howard. It was a fun day with a lovely bunch of ladies. The first shop we visited was called Dewdrop Inn Patchwork & Craft. This vast store has a huge variety of fabrics and notions. Linda (from Dewdrop Inn) showed us some new products and a demo. (And provided the group with a welcome morning tea). After shopping for our fabric fix at the Dewdrop Inn, we had a picnic lunch in a nearby park beside the Bay. Next stop, a little country town called Howard. Here the owners have two stores, a Drapery, and a patchwork fabric store, which is in an old bakery building across the road. Lots of fabrics and bargains to be had there. Also a beautiful afternoon tea - Devonshire scones and tea/coffee. Yumm! A few of the fabrics I bought. I haven't any projects in mind for these fabrics yet....just adding to my collection, as you do!